Two types of cylinder concrete crushers will be exhibited at bauma by Demarec: the DCC-30 which is suitable for machines between 20t to 35t and has a jaw opening of 1150mm, and the brand new DCC-50 for machines from 35t to 55t with a jaw opening of 1500mm. The DCC line now consists of six models suitable for machines with weights between 18t to 80t. The basis of the lines development is the increasing demand for a powerful 2 cylinder concrete shear with a satisfactory operating weight. This makes the DCC extremely suitable for high reach demolition machines. In combination with the newly developed ‘DemaPower’ 2.0, the cylinder and tailored jaw geometry of the DCC concrete shears produces 25% more force on average than similar shears, ensuring faster cycle times. The DXS-40 is suitable for machines with a weight of 25t to 32t, with the DXS-50 being suitable for machines between 35t to 50t. The Demarec DXS scrap shear with its 360° rotation has been engineered to provide users with a scrap shear with a maximum force, high speed and an optimal weight to performance ratio for daily use in scrap yards and demolition sites. With three different mounting options, the DXS line is available in six different sizes, suitable for excavators from 14t to 100t operating weight. 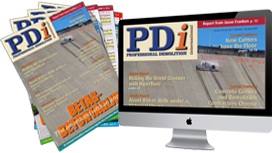 Demarec’s multi quick processors have been developed for efficiency. The MQP (Multi Quick Processor) is available with jaws suited for the cutting and pulverizing of concrete constructions, reinforced concrete, and for the cutting of steel constructions and scrap, with all jaws being suited for the heavy duty tasks associated within demolition and recycling. The MQP is equipped with two rotation motors with shock valves for extra rotation power. Over more, the oil transit has been supplied with an extra channel which can be optionally equipped with a greasing system or water spraying system. Demarec MQP's have a very advantageous power to weight ratio and a big jaw opening. 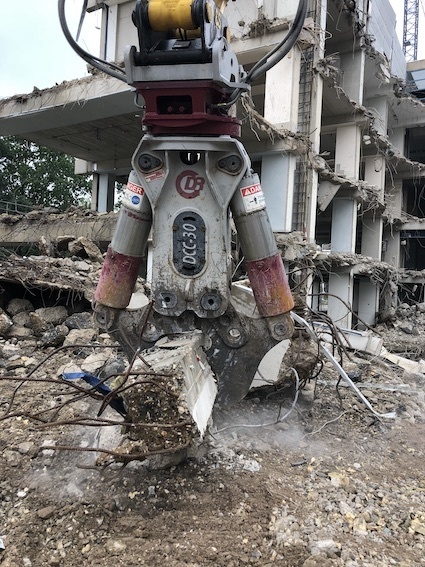 By using the new ‘DemaLink’ system, which has been developed by Demarec itself, the jaws can be changed hydraulically extremely rapidly and easily, thus in less than 10 minutes the MQP can be changed from a scrap sheer into a concrete pulveriser or a concrete cutter. The Demarec demolition and sorting grabs have long been used in demolition applications, with the proven concept being widely used in recycling and other applications as well. At bauma the DRG-27, suitable for machines with a weight of 20t to 30t, will be exhibited along with the DRG-25. The grabs are characterised by their powerful closing strength and the robust construction of the yoke which has a box frame with wide pivot points using bearings and ‘over dimensioned’ pins and bearings. The so called ‘Delta-Box’ frame construction in combination with a single large diameter cylinder ensures low reactive forces at the hinging points. The application of a single cylinder makes the grab easy to service and reliable because of the simplicity of the hydraulic system. The shells are equipped with a perforated shell plate made of high grade material as standard. This construction gives extra torsion rigidity to the shells, prevents material getting stuck in the shells, and gives optimal visibility on the job. All grabs are also fitted with filters in the rotation circuit as standard. The application of the standard load safety valve in the grabs open / close circuit ensures operational safety when working with the demolition and sorting grabs. For example, unsafe situations when picking up and laying dock boards are avoided as is the avoidance of the oil overheating as the machine keeps up its cycle speed. The DMS multi shear is the ideal flexible shear for use with midi excavators. The DMS is a truly a multifunctional shear thanks to the mechanical change system and the wide range of available jaws. The jaws are available for cutting through reinforced concrete (DMS-05-C), scrap (DMS-05-S), and for cutting cables (DMS-05-V). The DMS-05 can be used for both primary and secondary demolition work. All jaws are fitted with replaceable wear parts where possible, with the jaws being able to be quickly and safely changed in just a few minutes. Demarec has developed, and will be launching at bauma, a brand new range of hydraulic breakers up to 15,000kg (said to be the biggest breaker on the market today) which are suitable for carriers of 0.8t – 200t in weight. The breakers are suited for any job, from simple excavation, to use in quarries and mines. The FX series breakers are suitable for secondary demolition work, excavations in quarrying, working in urban areas, pipelines and railway tunnels. The SB series is suitable for carriers between 0.5t – 11t, have a ‘monobloc’ body construction. The breakers are manufactured in one piece and there are no tie rods. The hammer works with nitrogen inertial energy recovery, with the gas giving more power to the machine and also reducing stress on the arm of the excavator. In the past the hammers that work with gas energy recovery requires frequent reﬁlls. With the SB range, using special sealing rings on the ﬂoating support, increases by 300% the residence time of the gas. The particular body construction, closed casing box, and the insertion of sound absorbing material, provides low working noise levels. Drum cutters suitable for machines from 6t-60t, and a line of four crusher buckets for machines from 15t to 60t will also be exhibited at bauma. The buckets are said to have a breaking capacity of approximately 25% higher than others on the market, with the screening buckets having a long run in tray providing a large screening volume. Furthermore, there are three models available with milling wheels in different diameters. These are extremely suitable for removing rocks, concrete foundations, concrete decks and walls, and so forth. These make them particularly suited to working in places where little vibration and noise is permitted.